The Elite Four, as the name might suggest, is comprised of four Elite Trainers, some of the best found in the entire Kanto Region. In order to become the Kanto Region Champion, you must first defeat all four Elite Four Members in battle, consecutively no less. The fourth and final member of the Elite Four is none other than Lance, the same who was actually the Champion of the Kanto Region before being recently defeated by another trainer. Lance specialize in Dragon Type Pokemon, but since there are so very few Dragon Types in the Kanto Region, he will use a balanced team comprised mostly of Pokemon that are part Flying Types. All of his Pokemon will be at Level 54, except for his beloved Dragonite that will be at Level 55. In all, he will battle using Seadra, Aerodactyl, Gyarados, Charizard and Dragonite. Since Seadra is a Water Type and the rest of his Pokemon are part Flying Types, Electric Type Pokemon and Attacks do wonders against Lance. 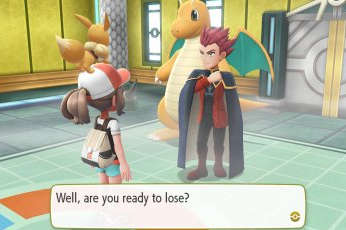 Outside of Dragonite, who you will need to have an Ice Type Pokemon or Attack to deal best with, Electric Type Pokemon and Attacks have their way against Lance. Since Zapdos is the best Electric Type Pokemon in the entire region, it would be wise to capture it before making your way to the Elite Four. Zapdos, if leveled properly, should be able to destroy all of Lance's Pokemon minus Dragonite. From there, as mentioned previously, one Ice Type Pokemon or Ice Type Attack should absolutely crush said Dragonite.